As we have said recently summer is here and we now have numerous different species available offshore here on our fishing trips. AND? the kids are out of school! 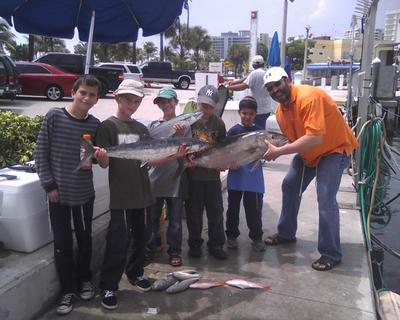 We continue to get lots of children aboard our FT. Lauderdale Charter Boat ?Marlin My Darlin?. A child or two and the fun begins. Lots of questions (often a thousand or two )and that is all good. Keep the lines open and time flies by all too quickly. Take the number of junior anglers up to three, four or five and the enthusiasm is electric. Some bottom bouncing on a spot in 250 feet by Capt. Kopper on this half day charter bent the rods for this group. Most mornings continue to be still with very little or no wind. We continue to enjoy surprisingly clean clear blue water all the way inside the reef line. Current has been moderate to the north inside of 400 to 500 feet. Outside of that and it picks right up. The seaweed continues to be everywhere.